99acres.com is India’s No 1 online property website located at Noida, India. 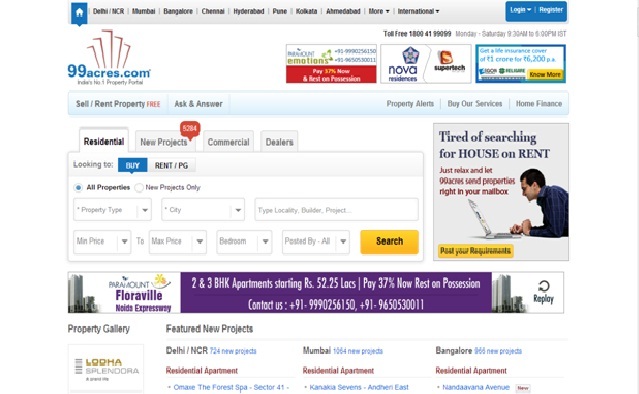 This website provides all the real estate information of the cities in India like New Delhi, Gurgaon, Noida, Mumbai, Bangalore / Bengaluru, Pune, Kolkata, Ahmedabad, Patna, Bhubaneswar and many more. You free to contact 99acres.com with toll free number- 1800 41 99099 (Mon – Sat, 9.30am to 6.00 pm) and also want to know more about property related news/ queries, mail at feedback@99acres.com.